Recipe and images submitted by Kitchen Friend Lori Havens. I met Lori way before the Friendship Bread Kitchen had been born. She’s a voracious reader and has read all of my novels written as Mia King, and couldn’t wait to read Friendship Bread when it came out under my own name. Is that a good friend or what? She read the book and three things happened. Lori developed a crush on one of the town residents from the novel, a minor character named A.A. Gilliland. Double A, as his friends like to call him, is the owner of a motorcycle shop and weekend Amish Friendship Bread baker (yes, you read that right). This guys knows his way around the kitchen. A.A. is 58 and a guy who is comfortable in his own skin. He’s a big guy — well over six feet, thanks to his Scottish roots — but very kind and generous. She really wanted to see him ride out of town with a jar of starter strapped to the back of his Harley. Seeing how A.A. only gets four pages in the novel, we’ll never know. The next thing that happened was Lori started making Amish Friendship Bread and passing the starter around like crazy. It was awesome. I have no idea how many people she got to make the bread, but there were quite a few. I think she single-handedly may be responsible for spreading it around our little town. Okay, maybe second to me … I passed out a lot of starters in 2010-2011. Here’s a great shot of Lori stocking up on gallon-sized Ziploc bags. Yes, the extra-wide seal helps prevent spillage, not that it happens often, but when it does … yikes! And then she did this — she came up with an amazing variation of her own. This is one of the first recipes submitted to the Kitchen using a sugar alternative. Agave isn’t sugar free — it’s a natural or real sugar with a significantly lower glycemic index, which makes it a go-to choice for people looking to give us processed and natural sweeteners. The result was … well, you can see it for yourself! In a word, success. Here’s Lori’s recipe for Apple Agave Amish Friendship Bread. If you end up making this recipe, we’d love to see a photo (you can upload your image here). Enjoy! This Agave Apple Amish Friendship Bread bread uses agave and has just the right amount of sweetness! Pour the batter evenly into loaf or cake pans and drip agave nectar on top. Bake for one hour and 10 minutes or until the bread loosens evenly from the sides and a toothpick inserted in the center of the bread comes out clean. From Lori Havens: "I got lots of compliments on this bread! This bread has just the right amount of sweetness and I preserve agave to other sugar substitutes (I can taste the Splenda in recipes and it doesn't work for me). I used carrot/apple pulp from a juicer (packed) worked great but chunky applesauce would work, too. This bread was moist and delicious, everyone loved it! 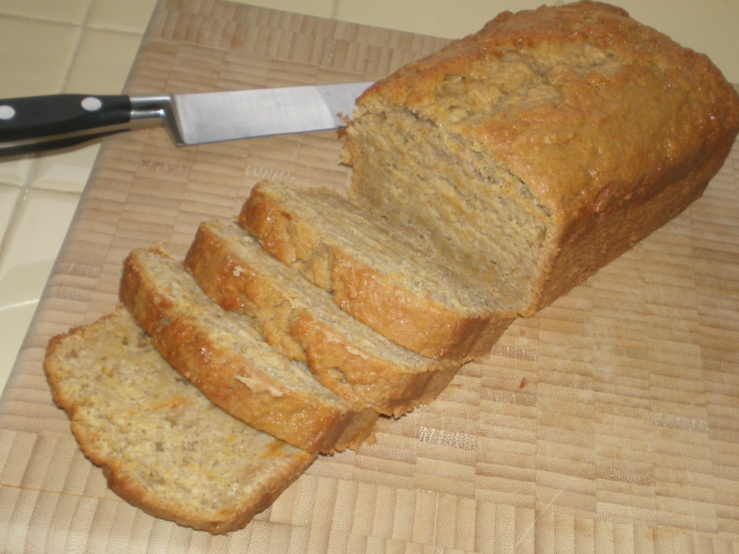 This bread was a big hit with my friends, even those not watching their sugar intake!" From Wikipedia: "Agave nectar (also called agave syrup) is a sweetener produced in Mexico and South Africa. Agave nectar is 1.4 to 1.6 times sweeter than sugar. Agave nectar is often substituted for sugar or honey in recipes. Agave nectar is sweeter than honey, though less viscous. Agave nectar consists primarily of fructose and glucose. Agave nectar's glycemic index and glycemic load are comparable to fructose, which in turn has a much lower glycemic index and glycemic load than table sugar (sucrose)." From Health | Eating Well: "Agave’s GI value is about five times lower than table sugar’s, according to a study in the American Journal of Clinical Nutrition ... Currently no studies compare how, relative to other sugars, agave may affect blood-sugar control. ... Agave packs 20 calories per teaspoon, 5 more than granulated sugar but, like honey, it’s sweeter than sugar, so you need less to achieve the same level of sweetness." I can’t wait to try this!! So excited!! I’ve pretty much put a hold on bakeing lately because of all the sugar…. Do all stores carry the Agave? Just have to be careful though…agave is still a sugar-like substance just like honey. So you get all the calories and diabetics need to really watch it with agave. BUT I love agave as a natural sugar alternative but alas not calorie free. Thanks Alise, I get what your saying. Natural sugars… Thanks for posting about the Agave..
Love all the friendship bread recipes! Also am very happy to see a sugar-alternative starter- was always not so happy with the HUGE amounts of refined sugar in the other starter/recipes- especially if using a pudding mix, also. I’d like to try this but I hope I can use a milk alternative.